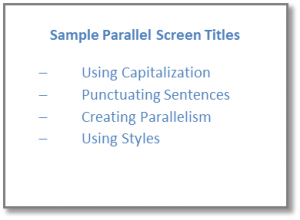 In grammar, parallelism (also known as parallel construction or parallel structure) is using two or more similar words, phrases, or clauses to balance a sentence, paragraph, or even an e-learning course. Parallelism is a professional polish that can improve clarity and readability. 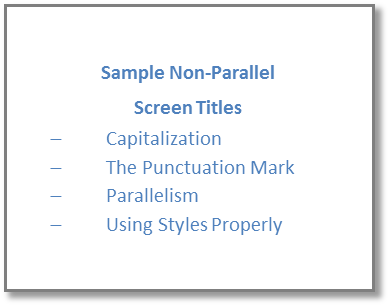 In an e-learning course, the two areas that need to be parallel (and where I find the most errors) are bulleted lists (sometimes called vertical lists) and screen titles. 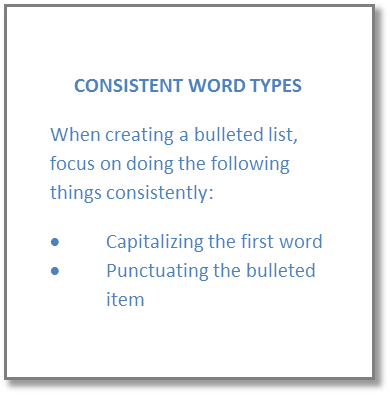 For bulleted lists, this means that each item in the list should be structured the same way. You have some choices here, depending on your style guide. However, the key to this is that they are consistent! 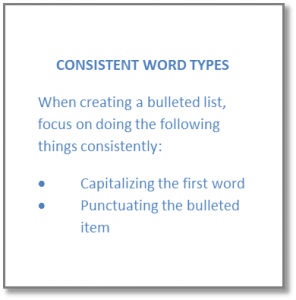 Let’s take a look at some ways to make your lists parallel and consistent. 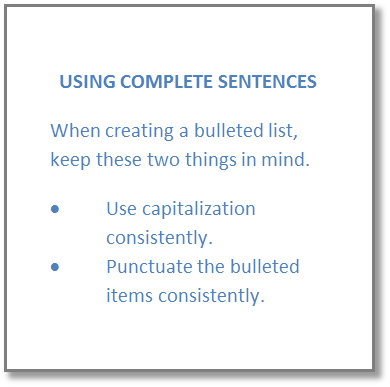 If you choose to use complete sentences, use complete sentences for every bulleted item in the list. 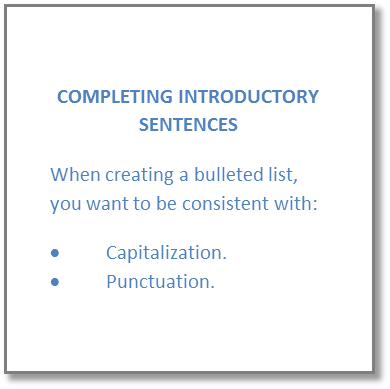 If you choose to have the bulleted list complete the introductory sentence, make every item in the list complete the introductory sentence. Make every item in your list start with the same type of word. For example, start the bullets with a verb, noun, or adjective. 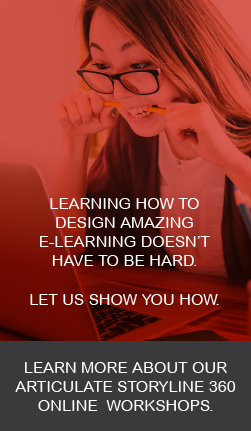 To solve this problem in your course, go through every list, and make sure it is parallel. Rewrite the bullets as needed to create parallelism. This is actually a tedious job if there are a lot of lists and the lists weren’t parallel to begin with. Do this exercise one time, and you’ll not soon forget to make the lists parallel as you write them! Screen titles are the parts of an online course where parallelism is often missed. I think this happens because in the storyboard phase the writer is thinking more about the content than what to call the screens, and in the editing phase the editor is looking more at the content than the screen name. 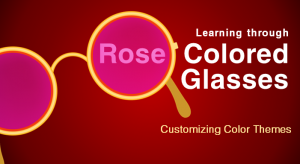 Here is an example of a grammar course with non-parallel screen titles. 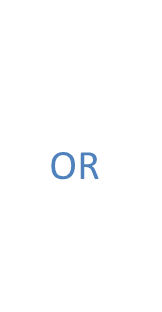 In this case two titles start with nouns (Capitalization and Parallelism), one starts with an article (The Punctuation Mark), and one starts with a verb (Using Styles Properly). 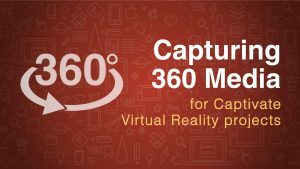 To solve this problem, create a naming convention before you even start writing the storyboards with examples of how the screen titles should be written. Then, don’t forget to edit the screen titles. I always go through every screen in the online version before I put my stamp of approval on it and read only the screen titles to make sure they are parallel. 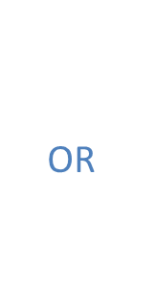 Here are a couple of options. 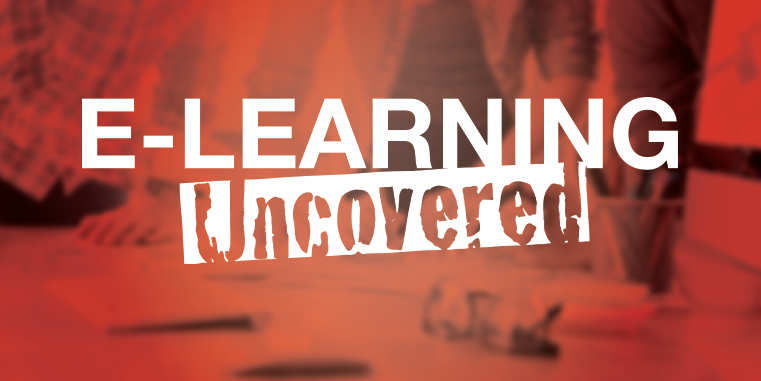 Now let’s see what you’ve learned. I have created some non-parallel items in this blog. Can you find them? 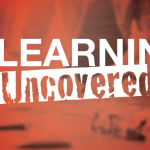 I’ll send an E-Learning Uncovered book to the first person who identifies all of the non-parallel items. 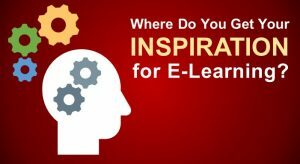 Just send me an email with what you find – desiree@artisanelearning.com. Once I have a winner, I’ll point out the nonparallel items in a response. 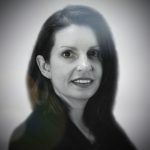 Enjoyed your post on parallel construction pitfalls. I see these issues frequently in the work that lands on my desk. I wanted to follow-up, however, because you never really make the case for why parallel construction is important. Is it just to appease the strict grammarians or do you feel there’s an instructional reason behind it? I’ve always considered parallel construction more of a best practice for writing in longer contexts, for example term papers and technical writing. It always seemed the style and grammar books were less concerned about bulleted and numbered lists than they were about stringing together paragraphs that were clear and concise. e.g. The babysitter told the children to finish their dinner, to keep quiet, and gave them advice on how to complete their homework. 1. 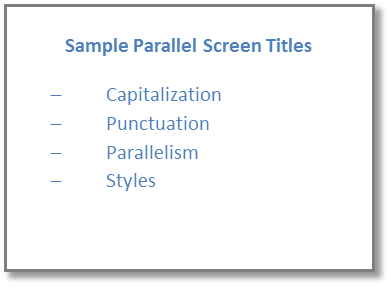 In the sample bulleted lists, the titles in the graphics are not parallel. 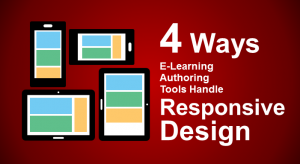 In the third graphic, the title should have used a progressive form of a verb as the first word of the title (such as Using Consistent Word Types). 3. The introductory sentences for the graphics in the Bulleted Lists section are not parallel. 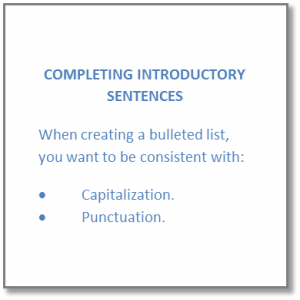 The first two introductory sentences start with “If you choose to…” but the third starts with “Make every items in your list start with…” This is a great example of how people forget to create a parallel structure in their writing. It’s easy to miss because they don’t have bullets. 4. There are two sections to the blog. If we are looking at an extreme instance of non-parallel construction, you can look at the lead-in sentence for each section. Some people might think this is a writer’s preference. While it may be okay and a writing preference, it is not parallel.